Striker Annie Heatherson praised her side’s character as they bounced back from last weekend’s defeat to Everton with a 4-0 victory over Durham. Heatherson scored twice in two minutes late on after Sarah Wiltshire and Helen Bleazard had put the Lady Glovers two goals to the good inside 20 minutes. 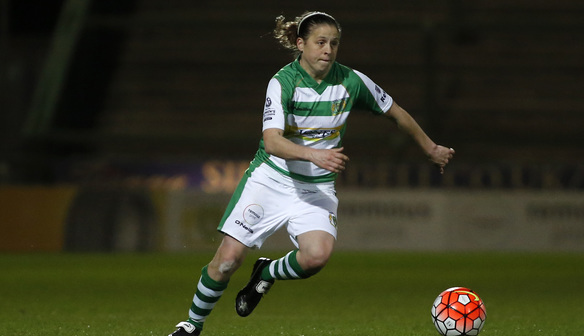 The win sends Yeovil back to the summit of the FA Women’s Super League 2 table, two points clear of Bristol City. “I think what’s going to happen this season is that we are going to have these moments where things aren’t going to go right for us and it’s going to be all about how we bounce back from them,” said Heatherson. “I thought today was a good test of our character as a team and as a unit and not to let something like Everton result affect us. “We went out on the pitch and we scored four goals; we’ve bounced back now and it shows how good we are as a team. We may get knocked down, but we are still building together. Yeovil could have been 3-0 up at half-time but for Durham goalkeeper Helen Alderson who pulled off a terrific penalty save from Wiltshire. Durham had chances to force their way into the match with Beth Hepple hitting the bar just after the hour mark. Manager Lee Sanders was left to rue the missed opportunities but was also full of praise for the league leaders. “I’m disappointed, but credit to Yeovil I thought that was the best opposition performance that I’ve seen against us all season,” he said. “It was totally deserved but we’ve had chances ourselves, in the first half we had six or seven but none of them hit the target and Yeovil’s have and that’s been the difference. “It’s a long journey, it’s a long way to come for what was one arguably one of our worst performances of the last few games.